We don’t mean to brag, but we’ve had a great start of the week! 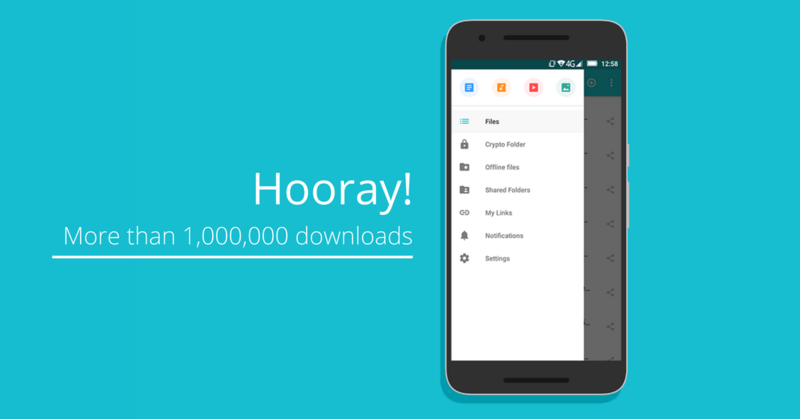 We just found out that the pCloud app for Android has been downloaded more than 1 million times. It’s convenient. Tap a button all your photos and videos will automatically move in pCloud. You can then delete the copies that are on your phone. If you’re like the average user, that’ around 10 GB of storage, freed up for more memories. Once your photos and videos are in pCloud, you’ll be able to preview and share them from your tablet, from your laptop or from any web browser. Work does not come on our desk only. Today, we can do so much more from our phones, while we are on the move. One of these things is sending large files. Meet the Download link – the simplest way to send large files over. Yes, larger than your email attachment limit. It is a unique link, which you can generate for your files in pCloud and send over as a simple text message. You can use it for basically any type of content, like your latest photo spree with friends, some photo edits you spent the night working on, or a new business plan. The great thing is that you don’t even need to have the files on your device so no unneccessary space taken. Ever needed to get a large file from someone, asap? Upload links give your friends, your coworkers, or your landlord the freedom to add files to a folder inside your pCloud account. It’s like an instant file transfer, where you get your file without giving access to anything else, and without taking any local space. Today, phones do so much more than just receive calls. You don’t need to be in the office or university to great things done. You can do a lot more when all of your files are in your pocket. That’s when pCloud for Android comes in handy. If you’re new to the app, you can try it out from the app store or from our official website.